Charter public schools that are poorly run or struggle financially most often also fail to deliver high quality instruction. Parents should be very selective in their choice of school; it is disadvantageous for students to attend schools that can’t provide the services and support necessary for a successful education. This is as true for charter public schools as it should be for district public schools. How many charter schools are in Idaho and how many children do they serve? There are currently 49 charter public schools comprised of 42 brick-and-mortar schools, 6 statewide virtual schools, and 1 distant education academy in Idaho that collectively serve about 20,219 students. Two new charter public schools are expected to open for the 2016-17 school year. Idaho’s charter public schools include professional-technical models, blended learning environments, alternative schools and a wide variety of curricular models. How are students enrolled in public charters? Charters are public schools and must enroll all students that apply to the school. If a school is over-enrolled then it must provide a lottery process for admitting new students. Those students not chosen in the lottery process are placed on a waiting list, and when a slot becomes available, the school will contact the first name on the waiting list. Enrollment and subsequent lottery processes must be performed each year and names cannot be carried over from a previous year’s waiting list. How many students are on waiting lists to attend Idaho charters? According to the Idaho Department of Education, there are about 11,000 student names on waiting lists who would like to attend one of the state’s charter public schools. This number includes families who place their student on the waiting lists of multiple charters in a single year. Do charter public schools enroll children from underserved families? Charter public schools enroll students of color and from low-income backgrounds based on applications from their community. In some cases, Idaho’s charter public schools reflect the demographics of their community and in some cases they don’t. How are charter schools started? Charter public schools are started and governed by parents, educators, or school innovators, but to operate a charter public school, a governing board needs to get approval from a charter public school authorizer. In Idaho, school districts, the state’s public charter school commission, and universities are the only organizations that may authorize charter public schools. How long does it take to start a charter school? Starting a public charter school in Idaho is no small undertaking. The process is spelled out in Title 33, Chapter 52 of state law. A successful charter petition used to take two years to move through the approval process. In 2017, the Idaho State Legislature passed HB279, which substantially reduced the time it takes to move through the petition process. The petition must then be submitted to a local public school district or the state public charter school commission (currently no colleges or universities are authorizing schools or accepting charter petitions). The charter petition is vetted by the proposed authorizing entity (Local School District or Idaho Public Charter School Commission) and ultimately approved, denied or returned to the proposed governing board for editing. The charter petition must detail the proposed academic program that addresses among other items how the school will identify what it means to be an “educated person” in the 21st century. The petition also provides details on standardized testing, employee hiring practices, health & safety issues, attendance areas, lottery procedures, and provides evidence that the school can meet a number of financial, legal, facility and compliance requirements. If after all this, the charter petition is approved, then the initial charter would be issued by the authorizing entity for a term of three years. Charter school students in Idaho perform well on required standard assessments in comparison to other Idaho public school students, and Idaho’s charter schools as a group are well rated academically. How about? According to the State Board of Education’s Public Charter Commission, charter schools outperformed most district schools on the Idaho Standards Achievement Test (ISAT) in areas such as Boise, Coeur d’Alene, Moscow, Nampa, Kuna, Lakeland and Twin Falls. Idaho charter school students as a group perform better on National Assessment of Educational Progress (NAEP) reading and math assessments than their district school peers. In 2015, fourth and eighth grade charter students outpaced their district peers in both reading and math. But not all charters are high-flyers academically. There are a number that have performed below state averages on state testing and we recommend you look at the performance of schools in your area using Idaho EdTrends. How are charter public schools held accountable for outcomes? Charter public schools introduce an unprecedented level of accountability into public education. If a public charter school is not improving student achievement as laid out in its foundational charter agreement, it can be closed down. This is not the case for district-run public schools, where failing schools often undergo school improvement and turnaround measures for years, while many children continue to receive a subpar education. Charter public schools must operate within all state and federal laws. They must abide by health, safety and civil rights laws, as well as business regulations and public body rules. The charter school’s authorizer is responsible for enforcing these rules above and beyond the laws that all public schools must follow. Charter school students receive the same state and federal dollars as traditional school district students (these funds follow students to their school of choice), but they do not receive local tax dollars. Further, unlike traditional public schools, charter schools are not permitted to participate in local bond issues to fund their facilities. As a result, charter schools spend approximately $700-$900 per student from their operating revenue each year on facilities costs. Recent changes to state law created a Public Charter School Facilities Equalization Fund that will create an independent funding stream for fixed facilities costs. This fund will represent 20-30% of what traditional public schools receive each year for facilities, through bonds or levies, and should begin to help reduce some of the disparity between district and charter school facilities. How do charters compare when it comes to things like teacher compensation? Charter schools hire certified and highly qualified teachers and, like other public schools, offer employees health insurance and retirement benefits and are part of the Public Employees Retirement System (PERSI). Charters offer competitive teacher salaries. In 2011-12, the most recent data accessible, charter teachers on average made $42,000 annually compared with traditional school teachers who made $43,000. Charter schools are far more likely to offer performance-based pay incentives than traditional schools and in some schools merit pay can add 5 or 10 percent to a teacher’s salary. Charter school teachers tend to be younger and make more earlier in their careers at charters, but more senior teachers usually make more money in district schools where traditional pay scales reward seniority, credentials and master degrees regardless of performance. 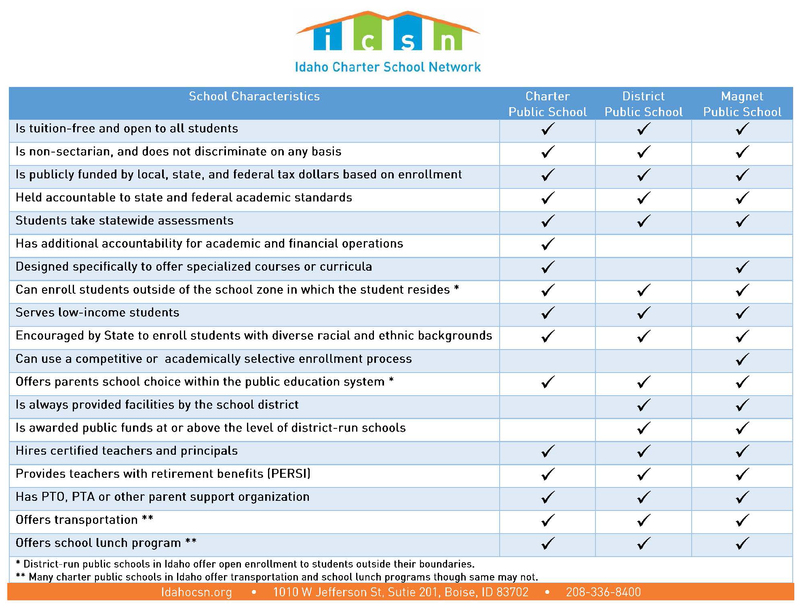 See our School Characteristics Comparison Charter here. FACT: A 2015 report by Stanford University’s Center for Research on Education Outcomes (CREDO) found that overall, students enrolled in urban charter schools gained 40 additional days of learning in math and 28 additional days in reading compared to their traditional public school peers. Given that more than half of all charter schools are in urban areas, this is a significant finding. MYTH: Charter schools take the best students from traditional public schools. FACT: Charter schools take all students who want to attend. If there are more interested students than available seats, the schools are required to hold lotteries, which randomly determine which students will be enrolled. Unlike magnet schools overseen by school districts, charter schools cannot selectively admit students. According to federal law, they must accept all students, including students with disabilities and English Learners (ELs), regardless of previous academic performance. FACT: There is no significant difference in the percentage of English Learners (ELs) served by traditional or charter schools. In fact, a 2015 report by Stanford University’s Center for Research on Education Outcomes (CREDO) found that urban charter schools are serving ELs particularly well. Hispanic ELs showed the greatest learning gains of any student subgroup, with 72 additional days of learning in math and 79 in reading. The most recent Department of Education survey data show that 10 percent of charter school students are ELs, compared to 9 percent of students in traditional public schools, however, there is no measurable difference between the two groups. More importantly, EL students are showing great academic success in charter schools.